1. Hawker Sea Fury FB.11 UB-471 of Burma Air Force, January 1959. Aluminium laquer scheme overall (not natural metal), with Red spinner and white and red chequered rudder. Note lack of arresting hook. proyectiles with HE heads and two auxiliary fuel tanks, probably aluminium laquer colored. 3.Hawker Sea Fury FB.60 L976 of Pakistani Air Force, on delivery route, 1953. 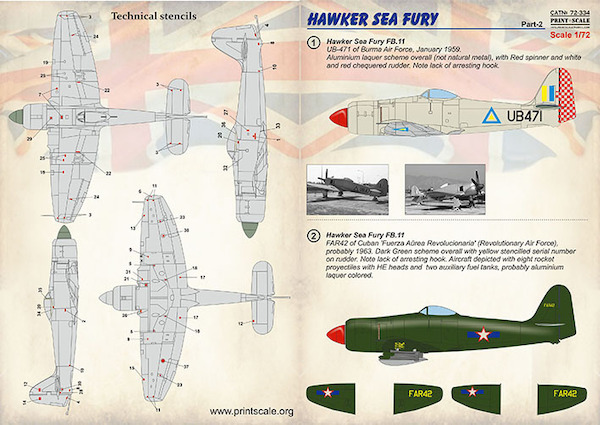 Camouflage scheme consisted of Dark Earth and Mid Stone over (probably) Medium Sea Grey undersides. This aircraft was a refurbished ex-FAA airframe. Note lack of arresting hook. Aircraft depicted with two auxiliary fuel tanks. 4. Hawker Sea Fury FB.60 321 of Iraqi Air Force, based at Basra in 1956. Camouflage scheme consisted of Dark Earth and Mid Stone over Azure Blue undersides, with white bands on fuselage and wings. Note Azure Blue spinner and lack of arresting hook. 6. Hawker Sea Fury FB.11 VH-BOU. Red overall with white trim in the mid-1960s.